When Chris Hughton took charge of Brighton & Hove Albion on New Year's Eve 2014, he inherited a side languishing 21st in the Championship. One year on, the Seagulls are in contention for promotion to the Premier League following a record-breaking start to the season. Here, BBC Sport looks at how the 57-year-old has transformed fortunes at the Amex Stadium. Hughton's predecessor Sami Hyypia was a left-field appointment by chairman Tony Bloom in the summer of 2014 - and one which backfired. The Finn had a successful playing career with Liverpool but was exposed in what was his second managerial job, and he resigned in mid-December following a run of one win in 18 games. Hughton, meanwhile, spent several years on the coaching staff at Tottenham, led Newcastle to the Championship title in 2009-10 and Birmingham to the play-offs in 2011-12 before going on to manage in the Premier League with Norwich. "Chris knows this division and that is very important," said BBC Radio 5 live pundit Jason Roberts. "To come from finishing 20th last year and be at the level they are now is a huge credit to him. A team that ended up down the division is now performing at a very high level. "It is an opportunity for him to create history with Brighton." Brighton's challenge for automatic promotion has been built on a 21-match unbeaten run at the start of the season, which saw them suffer only their first defeat of the campaign on 19 December against Middlesbrough. 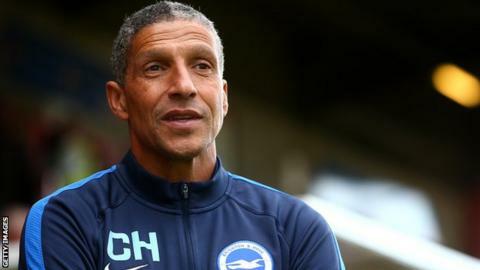 "I always felt if we could start well and get some stability we could certainly fare better than last season and challenge that top six," Hughton told BBC Sussex. "Would I have expected us to have gone on this run? The answer would have been no and it was a fabulous surprise, but something I think we have deserved. "The fact we got a really good start gave the players an awful lot of encouragement." It is Brighton's best start to a season and equals West Ham's post-war record of 21 games unbeaten at the start of a second-tier campaign, set in 1990-91. Including a draw from the final match of last season, Hughton has guided Albion to their longest-ever unbeaten run in the league, surpassing an 84-year-old club record. "In recent games they have fought back from losing positions," added former Reading striker Roberts. "They would have liked a few more wins from their draws but that shows you a determination to not lose and not go down. "That attitude is very hard to come by in this division, with so many games being so demanding on your body." Brighton's dealings in the transfer market during the close season far surpassed their efforts in the summer of 2014, with their scattergun approach leading to David Burke leaving his post as head of football operations shortly after Hyypia's departure. Goalkeeper David Stockdale and striker Sam Baldock are the only arrivals from that period who have regularly made the starting XI this season. Since then the Seagulls have added quality, experience and youth - with midfielder Beram Kayal joining from Celtic, Albion legend Bobby Zamora returning to the club and James Wilson coming in on loan from Manchester United. "The signings Brighton made last year were just not good enough," said former Brighton defender Adam Virgo. "They devalued the squad. "It is a compliment to the board and the manager that they have gone out and bought quality this summer." Hughton added: "For us it was always going to be about the summer and the players we brought in. "We lost nine and had to bring in that many. In an ideal situation you wouldn't want to bring in so many at the same time. That was the real challenge." Roberts, promoted from the Championship with Reading in 2011-12, believes Hughton's favoured 4-4-2 formation is a factor in Brighton's success. "At Reading we had a similar outlook on the game. It was about the details and playing a formation everyone understood," said the 37-year-old. "The way Brighton go about the game is on the front foot, home and away; putting the defence first, making sure everyone puts a shift in and then adding quality through the expressive players." Meanwhile, Hughton says the club's infrastructure, with a 30,750-seater stadium and a new state-of-the-art training ground, is one which has helped him succeed. "When I walked in, although we were a club that was down the bottom, it didn't feel like it," he said. "There is a very good structure here and we have an excellent staff. It is very capable of going to the next stage. Ultimately the aim is to be a Premier League team. "It wasn't as if I had to come in and change too much. I just had to try to change the fortunes of the team and what goes on on the pitch." After defeat at home by Ipswich on Tuesday extended Brighton's winless run to five matches, the Seagulls are fourth in the Championship heading into their home match against Wolves on New Year's Day. Hughton's priority as he starts his second year in charge will be to sustain their challenge for promotion - and he believes the backing from their supporters will be crucial if they are to have success. "We are going through a difficult period and we are finding it hard," Hughton said. "I think the fans have appreciated what they have seen in the first half of this season. They have been excellent - not only at the Amex but away from home as well, travelling in their thousands. "It is about keeping that going and getting behind the team in the best way they can."